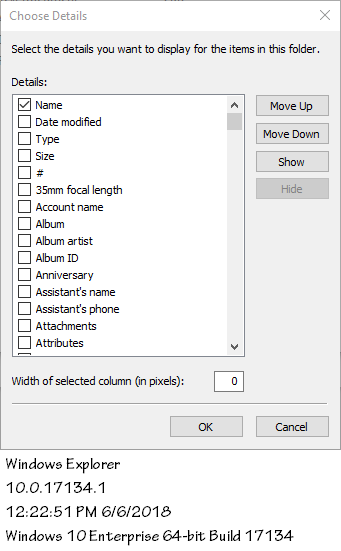 In Windows Explorer--in details view--I can choose to display from a list of 307 columns. How can I search this data with Everything? By default, "Everything" indexes all local fixed NTFS volumes. Indexes can be customized in the Everything options. Everything indexes file size and date modified by default. Anybody have suggestions for tools to index these additional file properties? Currently, Everything does not index, search or display these extended columns. I've added all these columns for the next version of Everything. I am still reviewing keeping this as most of them are not very useful or don't report any information at all. Width - image width, video width. Audio Bit rate - Audio encoding bitrate. Total bit rate - audio + video bitrate. i read this topic and these adds are very useful and promising, thumb up. however, i reached here by web-search because i wanted to find old photos i took years ago by my "iphone 3gs"
i hope you also add the ability to index or search for "camera" as extended properties. it will be very helpful in finding and organizing old bulky photos folders. thank you for ur great work. void wrote: Currently, Everything does not index, search or display these extended columns. about exif, do you plan to make all exif searchable? If not, location and camera model is my top candidates! I just love Everything, thank you for an extraordinary product! Of course these columns will be optional and not shown by default. Same with indexing, indexing will be optional and disabled by default. As a long time user of the standard Windows Search - I am impressed by the functionality and speed that Everything brings to the user. A while ago I started using the File Meta Association Manager to extend the property handler associated with a certain file extension. Now, I am looking for an option to track down the tagged files more effectively. Hence, my question: Is the upcoming version of Everything going to support the search of the extended metadata -- e.g. tags for, lets say, .pdf, .docx and .png? Hi. Am new here. Everything is brilliant, especially for the file hoarder me. I have a little question about the search syntax, precedence, wildcards and handling spaces. i need to locate all of the files that have contain Official Top 40 in the album column and dont want to limit to specific date. In windows search i would type Album:"Top 40" the results are returned corrcectly. I realise that Everything does not index content, but can someone give an example string to help me please? I've tried a lot of permutations but i'm either only getting the filename which contains the word album or i'm getting 0 results. Where would i put the * wildcard for albums that contain spaces? Strings with spaces need to be enclosed in quotes, right? album:"*Top 40*" produces no results. album:*"Top 40"* produces no results. .What is the precedence when using wildcards * and literal strings " "?
. Should i be using the AND operator (space) ? Thank you for any tips on how to achieve this. Also, will Everything GUI include those alternative column headers, such album, contributing artist etc? UPDATE: <album:Top album:40> is the correct syntax and works like a charm!! Awesome. also, here's a quick and nasty powershell snippet for renaming files that have digits at the front of filename. obviously, change the file extension and number of characters in the substring argument to meet your own circumstances. i'll work on it to auto move renamed files out. I've just not had the time yet. feel free to share any improvements. Looks like, album:"top 40", should do it. therube wrote: Looks like, album:"top 40", should do it.album:"top 40"
I might need to update my version then lol. i'm not getting what i was hoping for. i'm only a couple of releases behind. I clicked the HELP > Search Syntax in the main toolbar and saw the huge list of functions, but I was a bit dense around the subject of wildcards and literal strings when used with the functions. The help and documentation is exceptionally good, but that little snippet of info was what i needed to know and wasn't there. function:<=value	Less than or equal to value. function:>=value	Greater than or equal to value. function:start..end	Is in the range of values from start to end. function:start-end	Is in the range of values from start to end. EDIT: one other suggestion please, if it's not already on the delevopment roadmap, it would be absolutely brilliant if a CONTAINS or CO "" clause could be added? i know that is easily worked around with other operators, but contains is a bit more user intuitive? Thank you again for your great tool. All those columns have been implemented. I don't have a release date for testing yet. I was going to try the beta nightly builds that's why I asked. Thank you for work.